Sparky the Fire Dog and some Volunteer Firemen and Women came to teach us about Fire Safety! We each went inside the firetruck. We went in a special "smoke house" that shows us what it might feel like if we were in real smoke. We learned many rules about smoke and fire that can keep us safe! 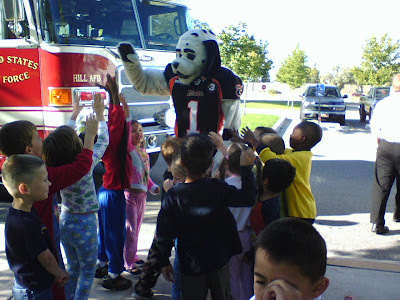 To learn more about Sparky click here. To learn more about Fire Safety click here.